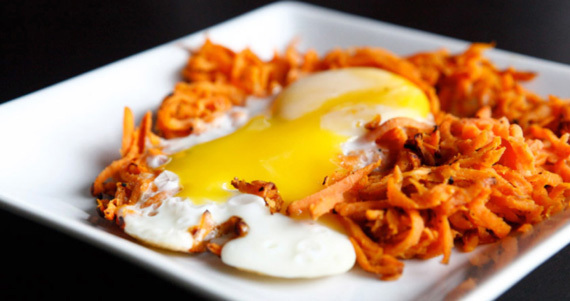 sweet potato hash with runny eggs – my favorite! I’m so excited to share this recipe with you! Sweet Potato Hash is one of my very favorite easy-peezy Paleo side dishes. I’ll pair it with eggs for breakfast, or sometimes I’ll add different spices to change it up as a veggie side dish for dinner. Sometimes I’ll blend it with sausage for a quick breakfast, lunch or dinner – doesn’t matter, it’s delicious any time. The easiest way to make this hash is to shred the sweet potatoes in a food processor. If you don’t have a food processor, you can use a cheese grater, but be forewarned – you will be grating for a while. I promise, invest in a food processor – it will allow you to make Cauliflower Rice, another of my favorite Paleo staples. Heat a large skillet to medium-high heat. Add coconut oil. Peel the sweet potatoes and cut into spears that will fit in your food processor chute. Or if using a cheese grater, start grating those puppies. Add chicken broth and salt, then cover the skillet and let simmer on low-medium heat for 10 minutes. This will soften the sweet potato to a hash-like consistency. Uncover skillet and stir thoroughly. Enjoy! To change up the flavor – I love adding 1 Tbsp of Cajun seasoning for a little kick. Or try garlic powder, onion powder, tarragon, thyme, sage, etc. Whatever!